I’m always looking for furniture inspiration, and the latest thing on my mind is green painted furniture. I have quite a few pieces of furniture just waiting for me to refinish them. And with yard sale season coming up, I’m sure to find some more to add to my list of things to do! 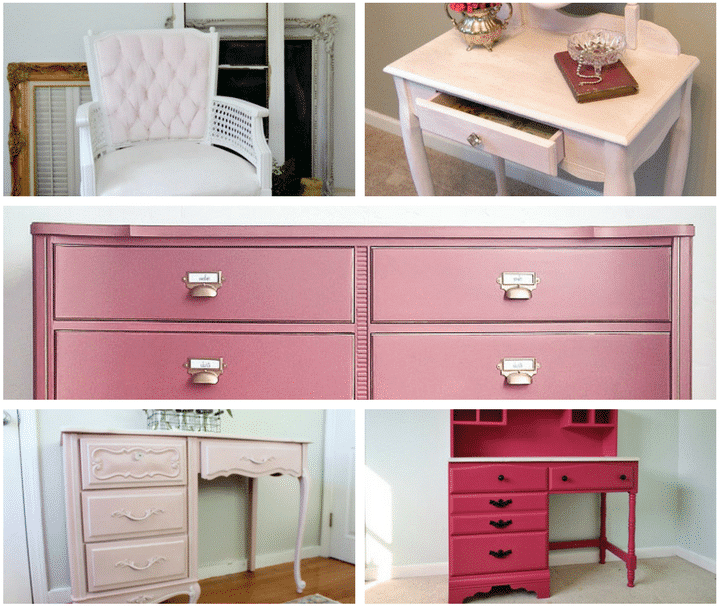 Paint is such a quick and easy way to update any piece of furniture. And if you happen to find a piece of dumpster furniture that you can transform with some paint, that makes for a very inexpensive upgrade! 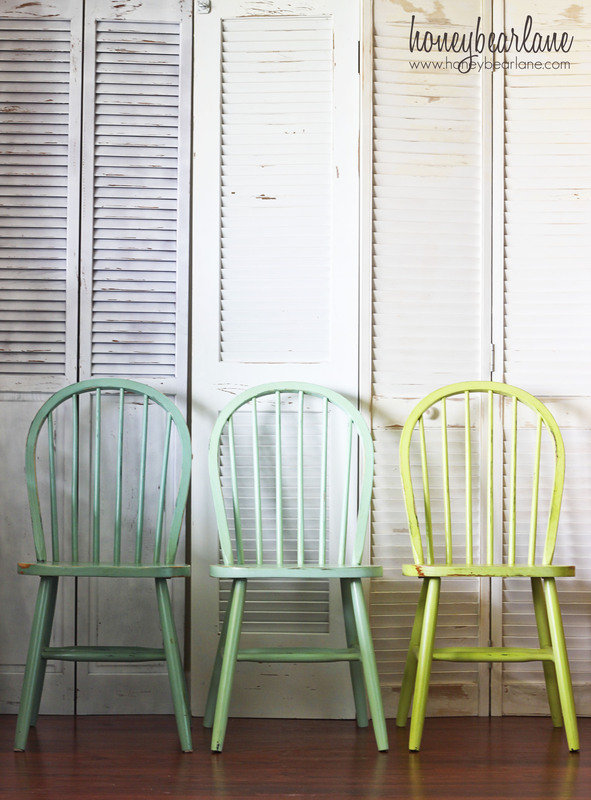 Whether you’re looking for lime, mint, or emerald, here is a roundup of some of my favorite green painted furniture pieces. Please pin the images from the original source. 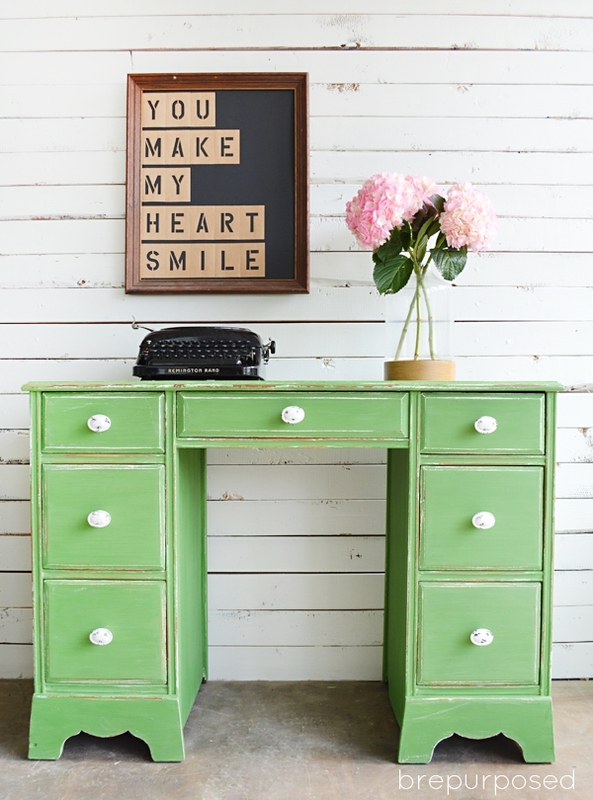 Bre from Brepurposed shows this green vintage desk makeover using powdered milk paint. She started by sanding down this pretty $5 yard sale desk, then did several coats of old fashioned milk paint. She distressed the edges, then finished with a satin wax. I love this clean green color, and it looks so pretty with the pop of pink peonies. Heidi from Honeybear Lane took some plain and simple Windsor dining chairs and created a beautiful mix of blues and green. She used a sample pot of paint from home depot for each chair, so this was a very inexpensive upgrade. Larissa from Prodigal Pieces took a very orange second hand dresser and transformed it into this piece with lots of charm. 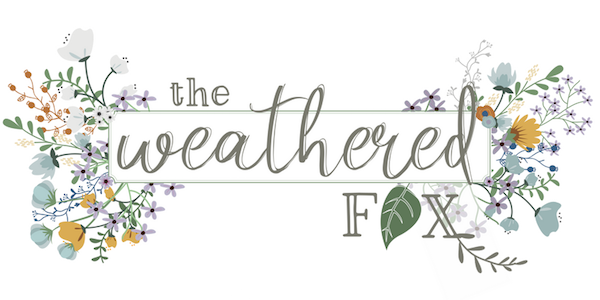 She first sanded down the top of the dresser and refinished it with a dark stain. Then she painted the dresser with a soft green milk paint, and finished with wax. The hardware really adds some pretty vintage detail to complete the look. 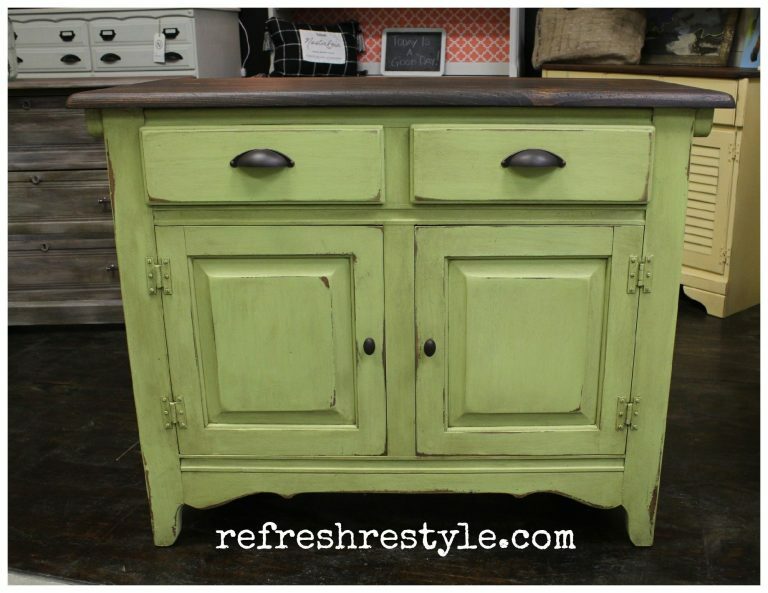 Debbie from Refresh Style takes a tired and dirty buffet and creates this beautiful fresh green painted furniture piece. She sanded down the top completely then refinished it with a Kona stain. She added oil rubbed bronze hardware to match the top, and distressed it and added detail with a dark wax. 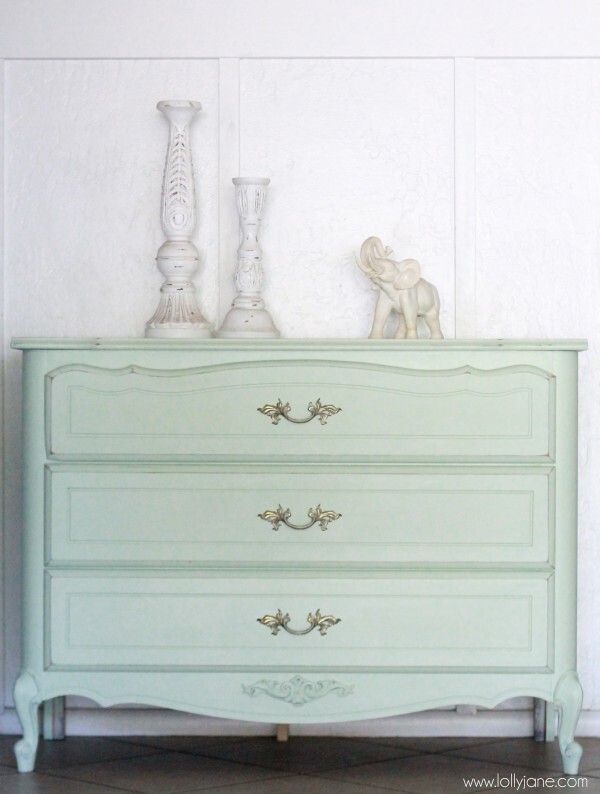 Kelli and Kristi from Lolly Lane share this pretty french provincial mint dresser makeover. They really encourage the importance of proper prep work, including sanding and priming. Proper prep works takes a bit more time, but it really ensures you get a professional result. She used the perfect pretty light mint paint. 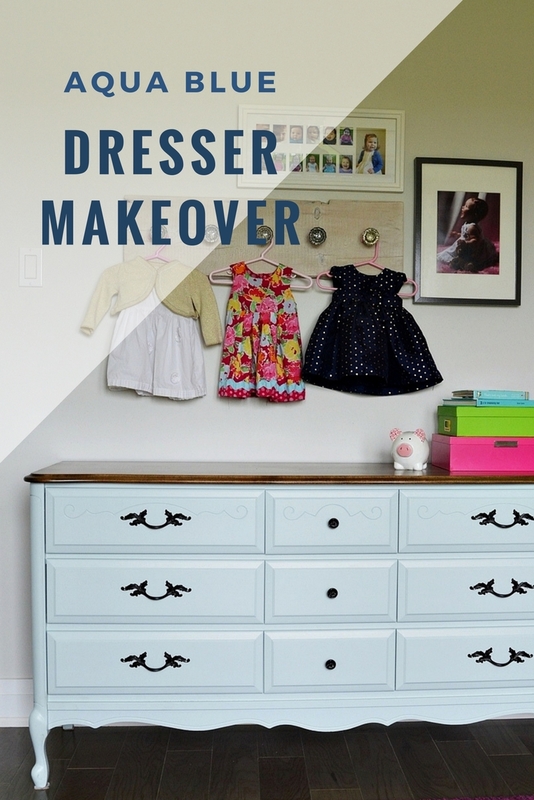 Here is another green dresser from Refresh Restyle. Debbie paired a dark walnut top with a rich emerald green paint. 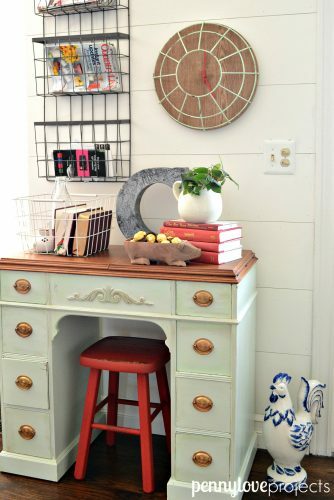 She used Annie Sloan chalk paint in the color Florence, plus a dark wax to really bring out the details. As part of our master bedroom makeover, I refinished a pair of bedside tables I found at a yardsale. I made a new top out of solid cherry wood, then painted the end tables using a custom mix of general finishes milk paint. The color turned out to be a perfect light lime green. Crystal shares this sewing table redo that she found on the side of the road. She refreshed the original brass hardware. Then she painted the sewing desk with a minty green she already had, and made her own chalk paint mixture. 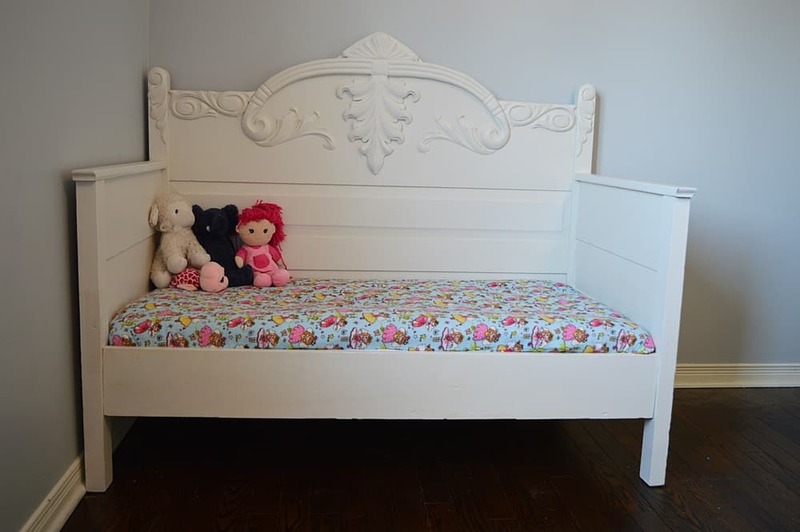 Marian from Miss Mustard Seed refinishes a plain front porch bench with a custom mix of green paint. It looks perfect with some black and white cushions and decorative planters. 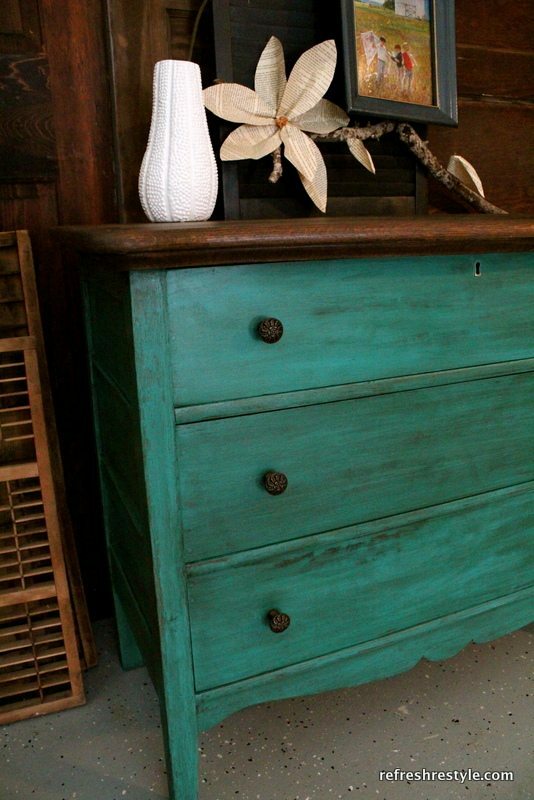 Kelly from North Country Nest mixed up a custom green color from some leftover paint and a can of primer. 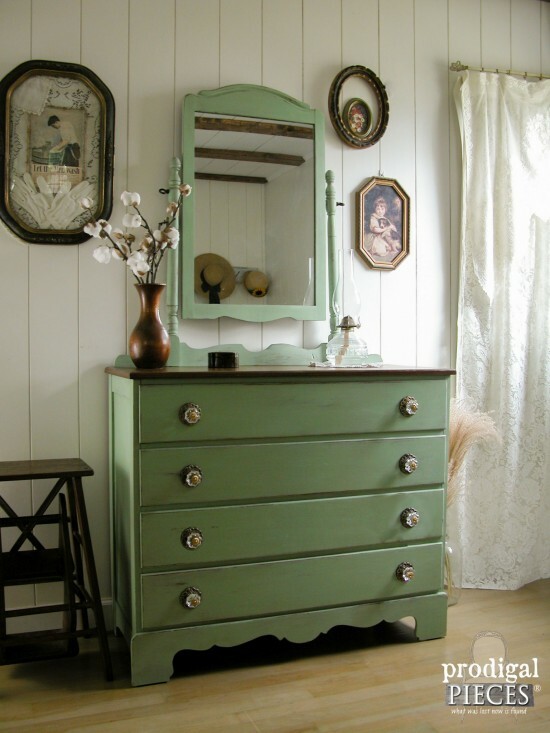 It’s the perfect green and works so well in her farmhouse style guest bedroom. 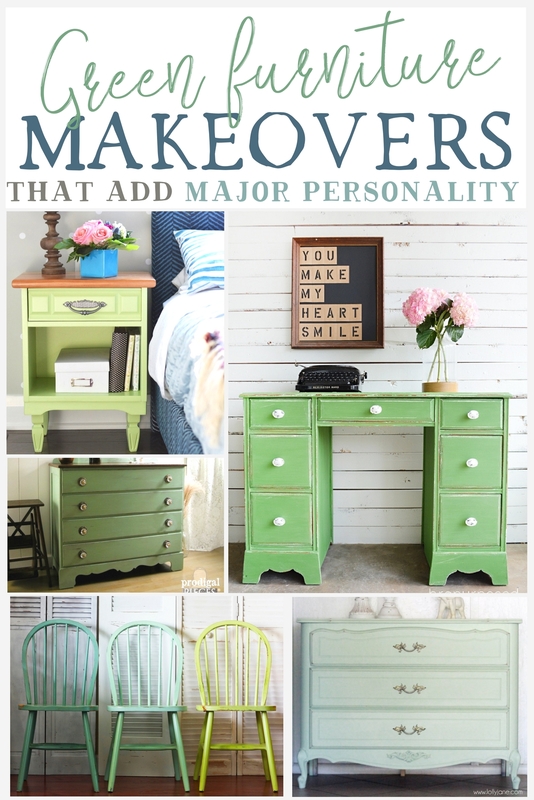 Thanks for checking out all these furniture makeovers! I hope you found some inspiration for your next piece. Please leave a note in the comments with which one is your favorite!